Considering a new mattress? Consider this: a small study conducted by the Better Sleep Council in 2009 study, found that subjects who spent one month sleeping on a brand-new medium-firm mattress reported significantly lower rates of worry, racing thoughts, nervousness, and irritability. In other words, a supportive new mattress = better sleep = significantly lower stress. If you’re ready to invest in your mental and physical well-being with a new mattress purchase, you’ll want to know exactly where to buy a mattress in Denver. Fortunately, there are an abundance of options; there are a total of 43 places to buy a mattress in Denver. Some specialize in luxury products, others in bargain buys, still others carry specialty mattresses to address sleep problems. We’ve searched the reviews and listings to bring you a comprehensive overview of mattress stores in Denver, all broken down by region. Read on and you’ll soon be resting and de-stressing on the mattress of your dreams. Denver City Furniture Mattress and Futons (1036 Speer Blvd) scores big in the reviews, with customers reporting excellent customer service, wide selection, and great value on name-brand mattresses, including pillow top, memory form and euro-top models. Another noteworthy mattress shop in central Denver is The Natural Sleep Store (928 W 8th Ave), which sells organic, chemical-free mattresses, bedding, and eco-friendly bed frames. Customers with green values, health-conscious lifestyles and chemical sensitivities report high satisfaction with this store’s products, which are made from organic rubber, latex, wool, and cotton. Another eco-friendly option is Essentia (144 Steele St). The bright, spacious and sleek environment makes this showroom feel like a chic boutique, and the high-end mattresses and white-glove service add to the luxurious experience. Essentia produces the world’s only fully-natural memory foam mattresses. Their products are made in Canada using organic materials such as cotton and latex, and many swear by the comfort and health-promoting benefits of their luxury mattresses. The store also sells a specialty line of performance mattresses, ProCor, which has a following among a number of professional athletes and is designed to promote recovery and enhance physical performance. 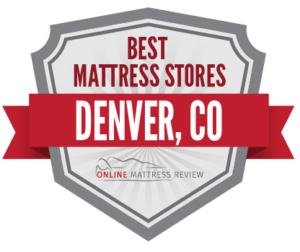 One of the best-reviewed mattress shops in Denver up to the north is Denver Mattress Company (5740 North Broadway), a local location of the popular national chain. The company was founded in 1995 in Denver, and sells top name brands along with “Doctor’s Choice,” their own, in-house brand of top-quality, affordable mattresses. Denver Mattress Company makes a charitable donation with every mattress purchase. Customers love this store for quality, value and knowledgeable sales staff. Just half a mile away, LUXE by Denver Mattress (5445 N Bannock St) offers the same top-rated customer service and value as their original store, but with a focus on luxury products. At this location, buyers can find high-end brands like Tempur-Pedic, Areloom and Vispring. There are decidedly few mattress stores in Denver to the South of the city. One of the few options in the region is Mattress Firm (7400 E Hampden Ave), which has a location in the city’s southeastern corner at the Tiffany Plaza Mall. Mattress Firm is the nation’s leading chain, and carries a wide selection of models from top brands like Sealy, Sterns and Foster, Tempur-Pedic and BeautyRest. Customers give great reviews to the stores highly-trained sales associates, who are very knowledgeable about the store’s products, and well-versed in providing sleep solutions. Mattress Firm carries a large number of specialty products, such as adjustable beds, hybrid mattresses, and mattresses made from high-tech materials like cooling gel. Another place to buy a mattress in South Denver is Home Stars (2645 S Santa Fe Dr). This affordable mattress and contemporary furniture store wins positive reviews for quality and value. Home Stars sells innerspring, cool gel and memory foam mattresses by Old West Mattress Company and airbeds by Innomax. The store offers an impressive 15-year warranty on air beds, and a one-year lowest-price guarantee. You’ll find no less than six mattress stores in Denver to the East, clustered along a single, mile-long stretch of highway. Along this “mattress mile”, customers can easily comparison shop and walk away with an excellent deal on a new mattress. Here, you’ll find Urban Mattress Denver (745 S Colorado Blvd), Sleep Number (895 S Colorado Blvd), SleepNation (1390 S Colorado Blvd), and two Mattress Firm locations: Mattress Firm Glendale (625 S Colorado Blvd), and Mattress Firm Colorado Blvd (1000 S Colorado Blvd). Of these, the highest number of positive reviews is awarded to Urban Mattress Denver. This store sells over 70 models of locally-manufactured mattresses, including innerspring, memory foam and all-natural models. Customers love the knowledgeable sales staff, who listen attentively to their needs and work within their budgets. The store offers free and fast delivery as well as mattress recycling and a 10-year warranty on all products. SleepNation (1390 S Colorado Blvd) has also earned an excellent reputation among mattress stores in this area of Denver. This store specializes in eco-friendly and low-VOC foam mattresses made from natural oils, such as castor, soy, and latex. While many natural mattresses command the typical high prices of a specialty product, SleepNation offers highly affordable mattresses, thanks to its local Thera-Pedic plant based right in Denver and factory-direct pricing. SleepNation also recycles old mattresses for free and offers a one-year exchange policy. Shoppers in West Denver will find less places to buy a mattress than their neighbors to the east. One of the few places to buy a mattress in the area is Mattress Firm Denver Highlands (3024 N Speer Blvd). Customers give top marks to this store for customer service, which they say is efficient, professional and knowledgeable, with zero sales pressure. Shoppers can choose from the wide selection of established name brands for which Mattress Firm is known, and shop with the confidence that comes with buying from a large store with a generous exchange policy. Further to the south, bargain hunters can check out Sleep Again Mattress Clearance (1934 W Mississippi Ave), which sells overstock, discontinued and slightly irregular mattresses at discounts of 50-80% off retail. Customers on a budget who aren’t set on a particular model can score an excellent deal, but would do well to check the inventory frequently, as the store continually brings in new stock.